I'd been meaning to do this comparison for some time, but either didn't have the time, some pens wouldn't cooperate, or the inks wouldn't come out as I thought they should. Missing are Vert Empire and Perle Noire, orphaned by an uncooperating Kaweco Sport and a Penmanship's converter I gave away. I have learned a lot on these forums so I hope this also helps others, particularly when comparing specific inks, like blue greens, blue purples, reds and oranges. The paper is HP 32 lbs, which all pens glide on, except for the Waterman le Man 100 with Mandarin which doesn't like this paper and sometimes stops flowing - there is always one! Oh and a Platinum Cool only starts reliably upside down, on any paper, I thought I'd cured it but nope. The differences between Souten, Kon Peki and Équinoxe 6 are subtle, and depend greatly on the nib and paper, and even on the pen and the time of day, as evaporation will change their colour drastically; but to my eye they clearly go from more blue to more green; they are all spectacular, Souten does have a funky smell, luckily I have a cold so I can't smell it as much right now, none of my other inks smell of anything. Some inks just make their pens glide, particularly Verde Muschiato and Verdigris. 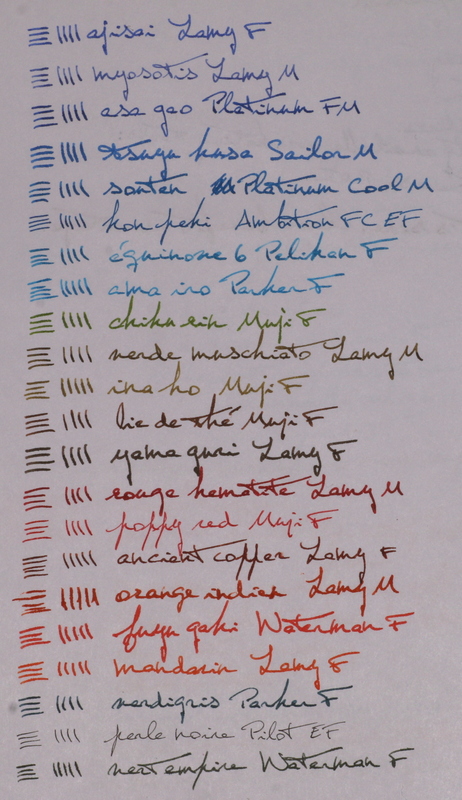 Some inks took a long time to show their true tone, like Myosotis (can look too dark, turns into a blue black), Lie de Thé (can look like milk chocolate), Orange Indien looks spectacular in this nib, a lot more boring with finer. Thank you for the comparision. I own a number of these inks and am always making comparisions myself. And this is great!! Thank you for sharing. @FOUR X FOUR: Thanks, I like them too! @amberleadavis: Ajisai, Asa Gao and Myosotis are quite purplish, but way before them I got Violette Pensee, which I really disliked, so much so I still wonder about my thought process in getting it (I get everything on the web). Souten is particularly beautiful, Équinoxe 6 is still surprising. Lovely to see. Thank you. Lamy red (looks pink? Not for me). Lamy turquoise (don't like it). Quink blue (I used to think all ink was blue or black or blue black!). Pelikan green (don't like it). Pelikan Königsblau (like it, seems to depend on the pen). J Herbin Violette Pensée (really don't like it!). Most of these were the only ones locally available, Violette Pensée is my one major online purchase mistake, which is pretty amazing given how some colours can vary wildly online - risk mitigated thanks to FPN! 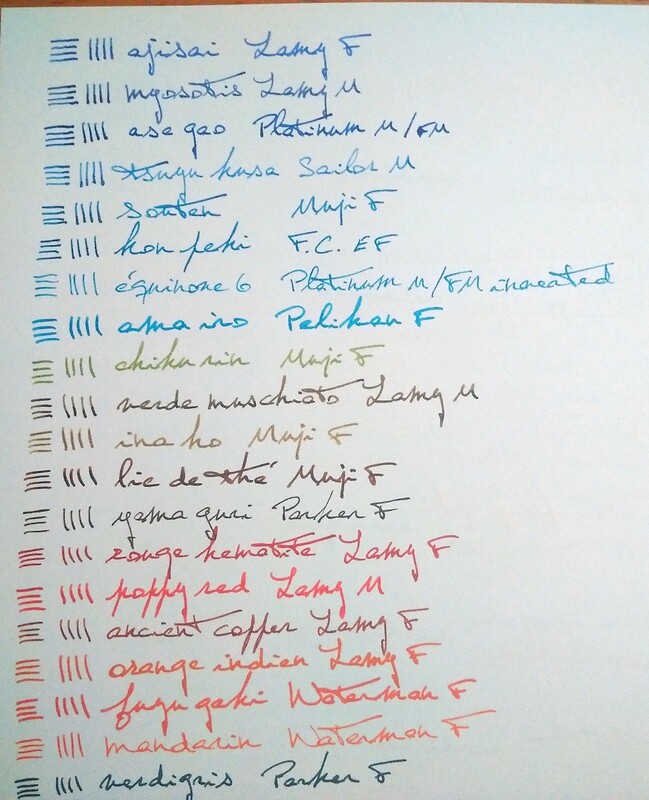 Update: changed a few ink and pen combinations, what might be of interest is the dramatic change in saturation for a few inks: Tsuyu Kusa, Souten, Équinoxe 6, Yama Guri. Tsuyu Kusa is in the same pen, I just pressed a little on the nib, barely enough to separate the tines, and... Voilà! Went from nice to holly cow! I knew there was a reason I thought of it as my favorite colour. I'm really digging Yama Guri in a new (used) Lamy Studio with a really smooth F nib. The collection is now complete, with Perle Noire and Vert Empire, today the Waterman Laureat started leaking Fuyu Gaki again... But with a little luck I have a Pelikan m205 on the way. Even if the paper looks yellowish (it's the same white HP 32 lbs) the colours are pretty much spot on, Ajisai, Myosotis and Asa Gao are clearly distinct in real life and on my display. I think I finally ran out of colours to buy!